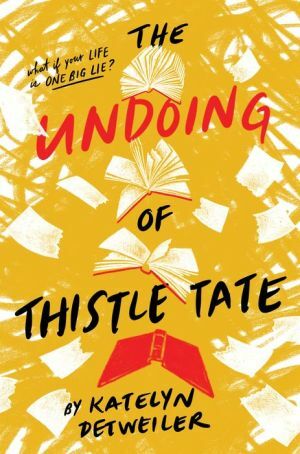 Famous teen author Thistle Tate struggles to keep her biggest secret: the real identity of the author of her bestselling books. 17-year-old Thistle Tate seems to have everything. The highly anticipated third and final book in her bestselling Lemonade Skies fantasy series will be coming out next year. Readers she's never met from all over the world adore her. Her best and only friend is the cute boy-next-door Liam, and they've finally started to date. They're so close he's the only one who knows her deep dark secret: she's not the real author of the Lemonade Skies books--her father wrote every single word. Thistle's guilt about lying intensifies after she meets Oliver, who introduces Thistle to his sister Emma, a super fan--how can she have a friendship with them based on a lie? She cannot wait for this last book to be written so she can be done with the ruse. But when the manuscript is due in just two weeks, her father has an accident. Thistle's editor and literary agent can't understand why she can't get those last chapters done--what difference does it make that her father is incapacitated? On top of that, Liam's getting jealous of all the time Thistle is spending with Oliver. As the deadline looms closer, it's only a matter of time before something gives, and Thistle's world becomes undone. For fans of Rainbow Rowell and E. Lockhart, this YA is the perfect summer read for teen bookworms everywhere, with a love triangle, an insider's depiction of the publishing world, and nonstop, page-turning action.